Lady Zurenne of Halferan only knows that her husband has been murdered by corsairs and a man she doesn’t even know stands as guardian over her and her daughters. Women in Caladhria have few rights in law and with this interloper keeping her isolated from family and friends, the widow is left utterly defenceless. Corrain, once a captain of the Halferan barony’s guard, is now a slave rower in an Aldabreshin raiders’ galley. He knows the man who killed his liege lord to be a rogue wizard, selling his skills to the very corsairs who have chained Corrain to that oar, along with the lad Hosh captured with him. If the two of them can escape, they have sworn to see justice done. Unless Jilseth, skilled magewoman and the Archmage’s confidante, can catch the renegade first. If the full extent of the treacherous mage’s villainy is revealed, at a time when wizardry faces challenges from outside and division within, the scandal could have direst consequences for Hadrumal. Jilseth and Planir’s other friends and allies are determined to prevent such uproar. This new trilogy came together as I found myself thinking more and more about just how that ‘no wizards in warfare’ rule might be challenged and what the consequences might be for Planir and for Hadrumal. 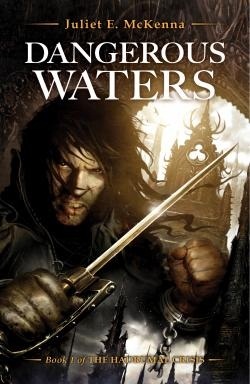 And a good number of readers had been asking what had happened to these characters whose personal tales were left unfinished in The Wizard’s Coming; the captured guardsmen and especially the family and barony left so vulnerable after Lord Halferan’s murder. In addition, quite a few fans over the years have asked hopefully if I might write a story set in Hadrumal itself. I’ve very much enjoyed this opportunity to satisfy them as well as to entertain and challenge myself by drawing together the hints and references from previous books and to explore the daily life of the wizard isle in greater breadth and depth, particularly the relationships between mages of all ranks from highest to lowest.